A garage is a place which is extremely hard to keep clean and shiny for a long time. Everyone starts out by keeping the garage space shining, clean and organized but over the time, the extensive use of tools for different of reasons make your space unorganized, greasy and untidy. So is there a way to avoid these unnecessary hassles? 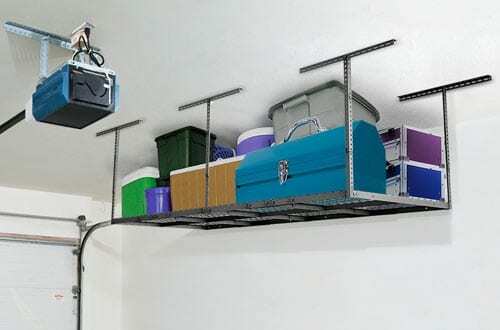 Yes, the intelligent garage storage racks are here to reward your unorganized garage with a cleaner and smarter look. 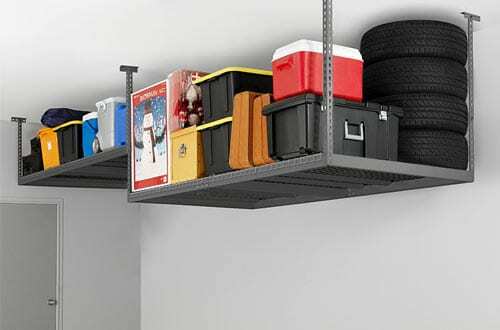 Gift your garage the much-needed change and attention as the wall-mount garage rack from Fleximount is designed to deliver a good experience in storing your tools and other things. It features an integrated grid design that is constructed with a stable and sturdy frame combined with separate wires so that every time you use it, you feel safe and sound. Moreover, it is constructed out of cold-rolled 14 gauge steel construction which is heavy and can withstand weights up to 600 lbs without having any harmful impact for a longer period of time. The presence of top-notch quality screws ensures a secure loading and all the hardware have been tried and tested under strict conditions for optimum results in terms of safety, functionality as well as longevity. Water damage is serious trouble that can seriously damage your tools and equipment inside the garage. 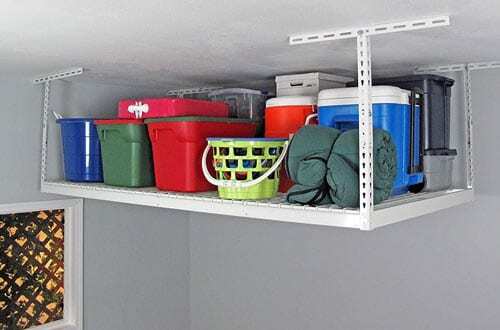 This garage rack is designed to save your machines by keeping them in the ceiling and away from water. 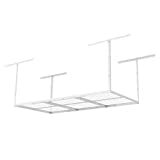 It features a reliable and safe design where you get an overhead rack with longer brackets on a ceiling and six vertical posts, a whole set up which is safe, sturdy and secure. Besides, it is manufactured out of high-end and heavy-duty cold-rolled steel and combined with high-quality screws that promise long-term durability and workability. The DIY step by step installation guide from Fleximount is easy and hassle-free. 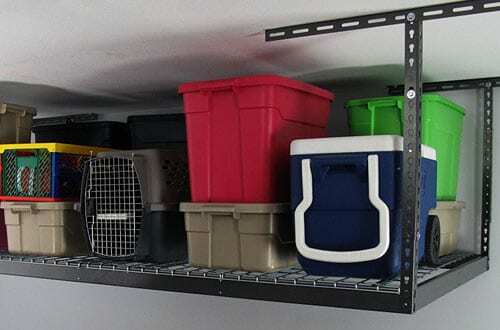 An ideal storage solution to give your garage a cleaner and organized outlook, the NewAge Garage rack does the job of organizing and saving your equipment efficiently. It features a size of 96”X 48”X 45” which is quite large for fitting most of your tools. The use of premium quality materials with powder coated paint finish saves it from any unwanted rusting and scratching. It also has a distributed weight capacity of 600 lbs making it quite ahead in terms of functionality. 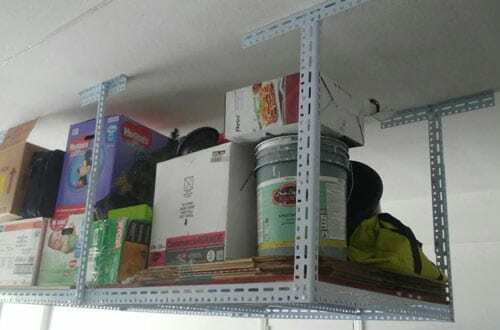 Furthermore, the height of the rack can be adjusted between 18” to 42” as per your need and you can also make adjustments in the length anywhere between 6 feet to 8 feet. It stays in the ceiling and helps you have more space on the ground for better working. The rack from the house of Safe Racks is one of the most reliable models in the market and it features an adjustable drop length for more flexibility of usage. The use of industrial grade materials and finished off with a powder coat finish ensures a safe as well as secure working every single day. Furthermore, the simplicity of the design makes its installation quite easy and hassle-free. Plus, the sturdy frame is capable of holding weights up to 600 lbs with ease. Most of the times, there is a shortage of space in our garage as working with tools and machines requires a lot of open space. 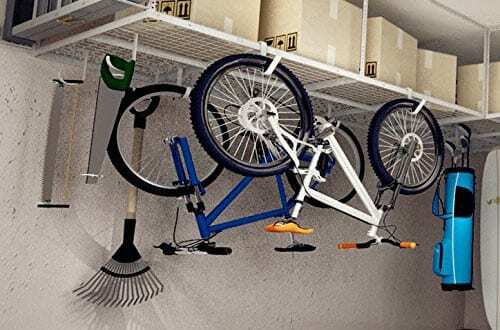 The garage storage rack from MonsterRax is ideally designed to make use of the wasted space thereby increasing the amount of space for easy working. Though the recommended weight capacity on this rack is 600 lbs but the high-quality materials used can withstand up to 1500 lbs with ease. Further, the industrial grade steel is used in the construction that adds to the stability and safety factor and use of powder-coated finish prevents it from rusting, scratching, corrosion, etc. The design also allows you to have a ceiling drop down length anywhere between 24” to 45” so that you have the control on your hand. Fleximount is a trustworthy name in the fields of garage racks and this product is yet another amazing piece that promises longevity and functionality at its very best. The design helps give your garage a clutter-free look and also increases the free space quite a lot. Flood damage, insects, and rodents will never be a concern as the rack hags overhead making it safe and organized. It features an integrated design that makes setting up and installation a less hectic job. Plus, the absence of a separate frame and wire makes it more stable as well as sturdy. Besides, it is built of cold rolled 14 gauge steel that lasts longer and is capable of keeping weights up to 450 lbs. Adjust the rack as per your desired length between 22” to 40” for flexibility of use. Keeping your work tools on the floor is extremely inconvenient when it comes to finding it again for further use. 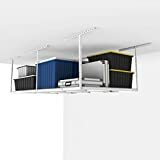 The trust and reliability of Fleximount are seen on this storage rack which hangs from the ceiling and is manufactured out of secure and top-notch materials. It features a grid design that gets assembled quickly and easily. Plus, also provides a sturdier and stronger frame. Moreover, it is made out of materials that undergo proven tests in the lab for assuring long-term usability and this particular storage rack has a weight capacity of 550 lbs. 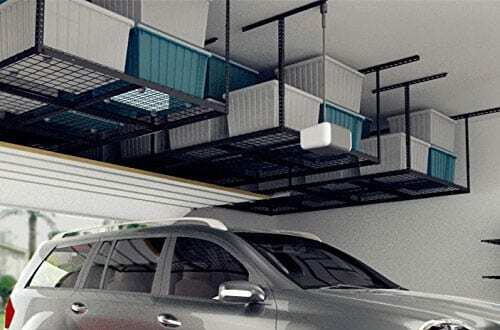 The different ceiling joists will not be of concern as the Fleximount garage rack is efficiently workable with both wood joists and concrete ceilings. 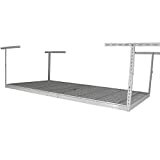 If you are looking out for a model of storage rack that has the ability to withstand huge loads with ease, the Bigbear Iron is certainly one of the best in this case. 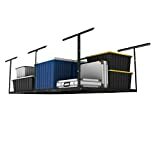 The storage rack has a weight capacity of 1000 lbs and the presence of 6 legs makes it extremely stable and secure. Moreover, the adjustable height of 24” to 36” and length of 52” to 98” on the rack adds to the impressive functionality. 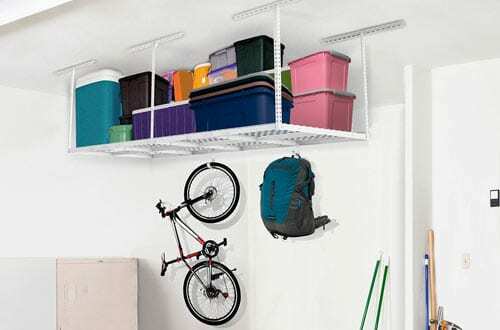 It is made to last for a long time and designed to help you have an organized garage space every day. Less used or seasonal equipment in your garage often succumb to the moisture and leads to complete distortion and damage to the tools. The Fleximount Overhead Garage Rack will be your saviour in this scenario as it will keep your tools safe in overhead and away from all the unwanted moisture as well as insects. It works like a wonder to save your machines from unforeseen flood damages and the heavy-duty construction can hold weights up to 600lbs. The use of premium grade materials like top-notch quality screws and cold rolled steel ensures long lifeline of the rack. Have the trust of Fleximount in your garage for a cleaner and organized space. The adjustable storage rack from SafeRack is a desirable product that has optimum workability and efficiency. The height can be altered between 24” to 4”, making it more flexible to use and the product is delivered in one single unit for easier accessibility and assembly. 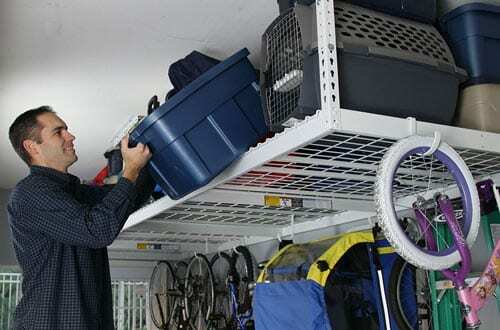 Furthermore, it features a patent design of SafeRack that makes it a more stable and sturdy storage rack which can be installed without any hassles whatsoever. 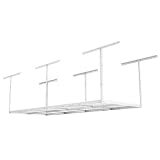 A distributed weight of up to 600 pounds can be stored on this hanging rack and the use of industrial-quality steel that has a powder coat finish will make it last strong for a longer amount of time. 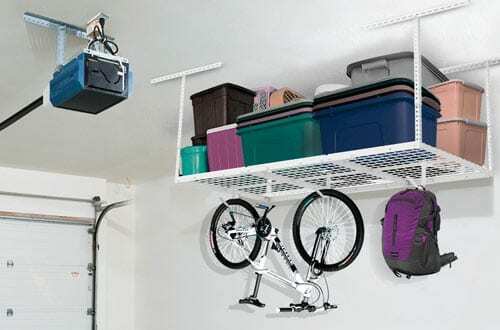 Undoubtedly, the best choice to make in overhead garage storage racks.